I first tasted Chef Osvaldo’s food at Forlino eons ago and it left a good impression. It was one of my first few attempts at fine dining so I admit, I did feel a little stressed! Ristorante Amarone’s more in line with how I like to dine- casual ‘fine’ dining (if there’s such a thing!) where talking a little louder is possible, and portions are more hearty. The complimentary Arancini di Riso was probably left in the open for too long. It was cold, and lost all the crispiness to it. A far cry from what we got from Il Lido. Had burrata (mozzarella and cream) for a change. It was good, but given a choice I’ll still go for just buffalo mozzarella. I prefer the lighter, milky flavour. Burrata’s heavier because of the cream, but the plus side is that velvety mouthfeel. All a matter of preference of course. 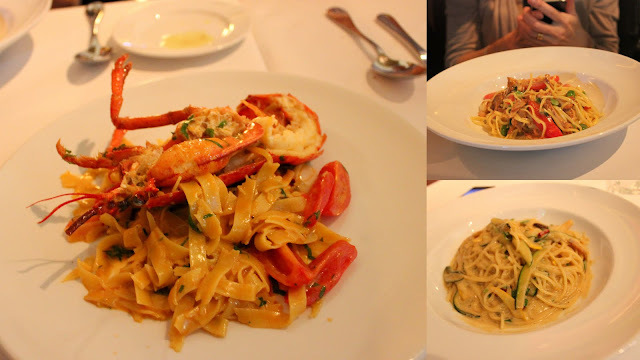 Obviously we had to go with what Chef Osvaldo is famous for- pasta! All handmade pasta and portions were generous. The cream base for my sea urchin pasta had too much cream, drowning out all the sea urchin flavour. A pity, because the spaghetti was perfectly al dente and the zuchinni shreds were generous. Otto does the best uni pasta IMO but they didn’t give me enough zuchinni that time. Il Lido’s great too- they serve the uni on top of the pasta- but it might be a little too sweet for some. An apple frangipane tart for dessert. Not something that I can’t make myself but still, one of my favourite kinds of dessert and the frangipane was delicious.